I wrote a reply to a post on FB the other day and as will often happen, as I wrote it, there was a a huge ‘aha’ moment and it was like someone hit me over the head and said finally!! You DO get it! 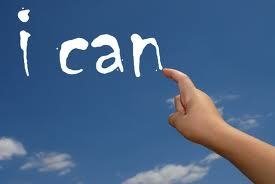 Funny how you can say something to someone else and it is just what you need to hear! Sometimes I surprise myself 😛 but how true is that! I kept thinking how I wasted the last 9 months and how things could have been different, but then when I thought about it I realised that the time was not wasted at all. I have come so far in the last year, and while I didn’t think it was really weight related, much of it actually was because of the increased confidence it has given me. It’s time I stopped thinking about what could have been and start looking forward – to the bright shiny new me – to the person I want and will become! If I had not spent those last few months (and years) living the life I did, I would not be the person I am and that would be sad. I am finally getting to a place that I like me. Mostly I don’t care what others think, I am who I am and now I am looking forward to the next 12 weeks and getting to know the newest version of me as I go 🙂 but maybe it is time to look back at where I was (physically) 12 months ago and really acknowledge that I have done good! I sometimes wonder who that sad looking person was. There are moments when she comes back but they are rare and very short lived. I have learned more about myself in the last couple of years than in the rest of my life I think. I am never going back to being that person – either mentally or physically! My first round I did everything really well – including the pre-season tasks but the last round I did I don’t think I logged in more than 3 or 4 times. Maybe that explains why I also didn’t lose any weight! 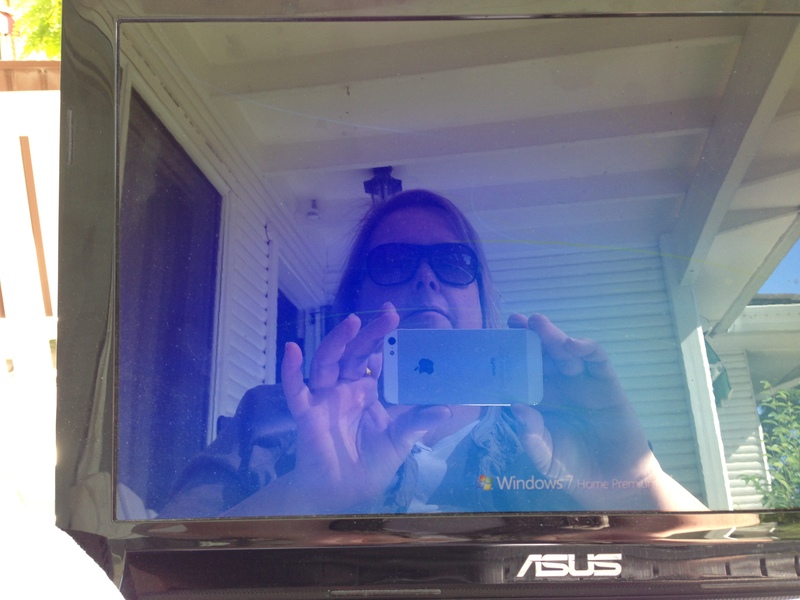 It was a beautiful day so I packed up the laptop and the water and headed outside for some peace and to do some work. Well – that’s them gone! Once they are out there and the solution found I have promised myself I won’t use them again. Of course that doesn’t stop me finding new ones, but I won’t let my head beat me this time! This is such a hard one for me. In the past I have never really set goals and just recently I realised it’s because I didn’t really think I deserved whatever those goals were. Now I know that sounds stupid but honestly I really didn’t know it was what I thought – and more recently I have come to realise I do deserve the best life has to offer. The only problem is I really don’t know what I want. 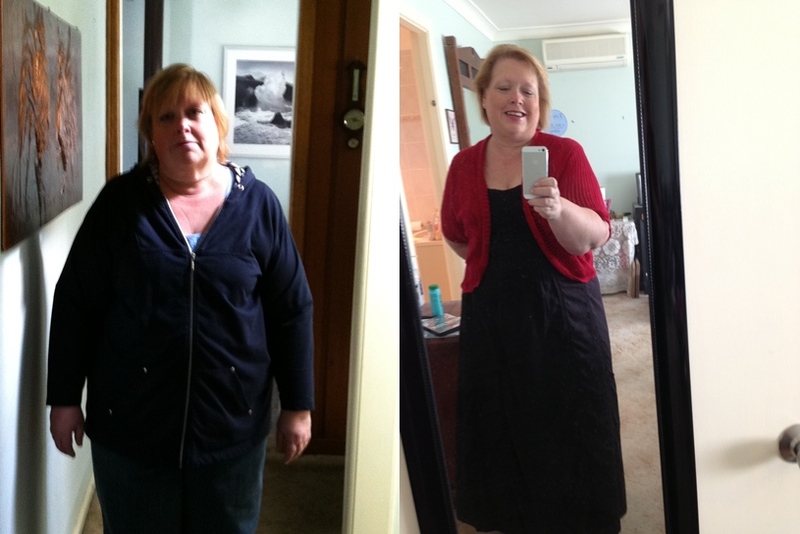 I have made a list of goals – many of them not centred on weight loss and I am pretty happy with them. – 4 weeks – walk Bay Run? •	To be one step closer to Paris – e.g writing course with Patti? Kitchen Make-over was quick – very little ‘bad’ food had crept in but I decided to get even more organised and spent one day cooking. 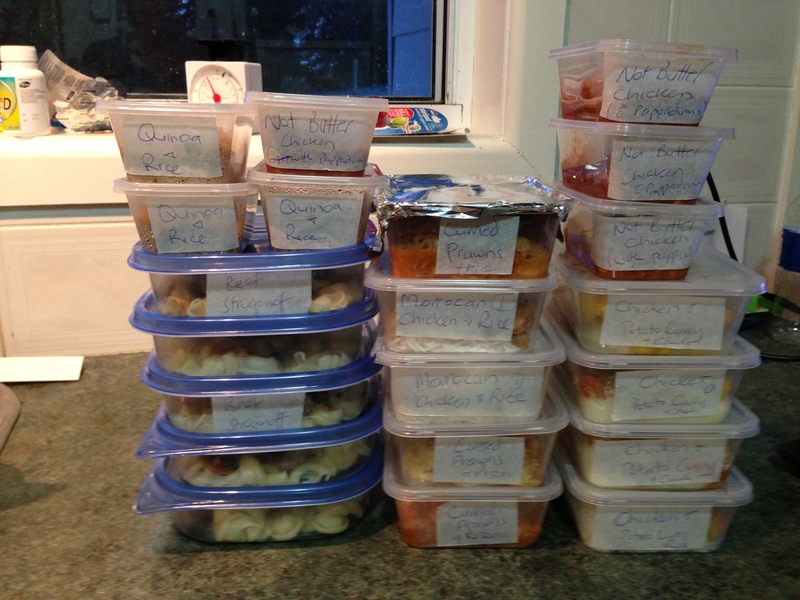 I ended up with 22 meals plus 5 or 6 more containers with parts of meals – not bad for a small freezer!. I have decided to cook two meals a week solely for the freezer so I will get more variety and keep the numbers up so I have no excuses when I am tired or just feeling lazy! This was the one task I never really did before. My life is so set in what days I work and don’t and everything revolves around that and sleep so it seemed a waste of time. 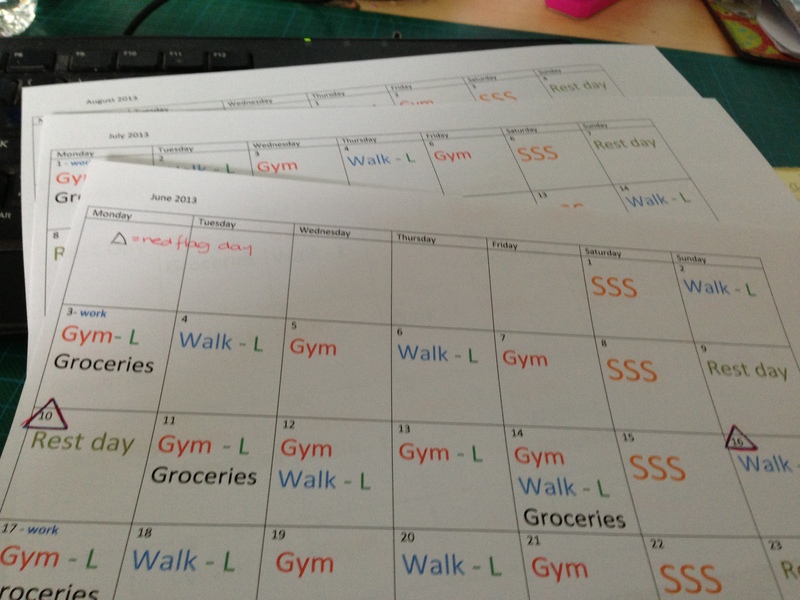 This time I decided to do it properly so I have made plans – menu plans, snack plans for work, exercise plans, plans that include Lachlan, plans that don’t. 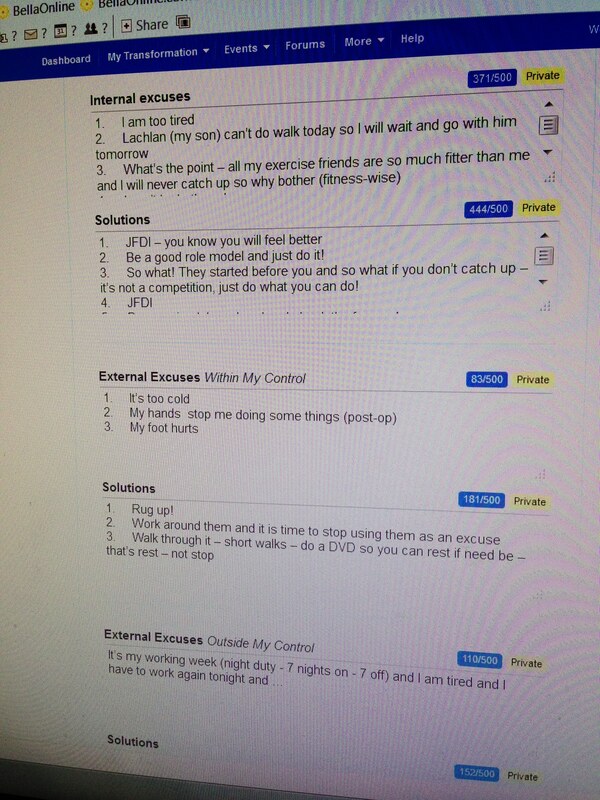 I have snack lists and exercise lists and menu lists. I even have a plan for snacks etc to take to work so I don’t wake up tired and not be bothered – now I just check my list and add in the main meal for the day. Fitness test is done (except push ups – my hands are no strong enough yet), measurements are done and I have even listened to the videos. I am even making an effort to actually post on the FB pages not just read. I have always loved quotes and words and have saved numerous quotes and pictures I love. Now I have decided it is time to have them around me to remind me why I am doing this. 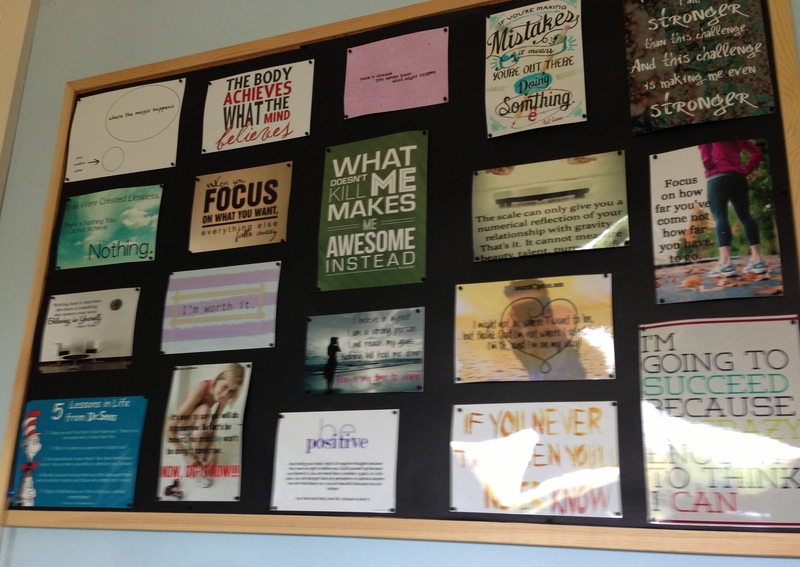 I made my board at the end of last year, but gradually more and more pictures are appearing around the house. My boys just shake their head but I know they are proud of me – even if they think I am a little mad! Lachlan is even beginning to talk about being healthy (and I am sure it has nothing to do with the promised trip to Fiji 😉 ) and comes to the gym with me 3 or 4 times a week and walks the other days. Food is taking a little longer but he is 15. 🙂 He is slowly getting it though and I am being very careful not to push too hard and I emphasis the health aspect rather than the weight loss. Of course he knows it is both but I don’t want him with a warped sense of what is ‘acceptable’ like his mother – and teenage boys respond much more to being fit than losing weight! I am determined to do this properly. The real test will come next week when I am back on nights but I have allowed for that so I guess the proof will be in the pudding .. or in this case, the scales. 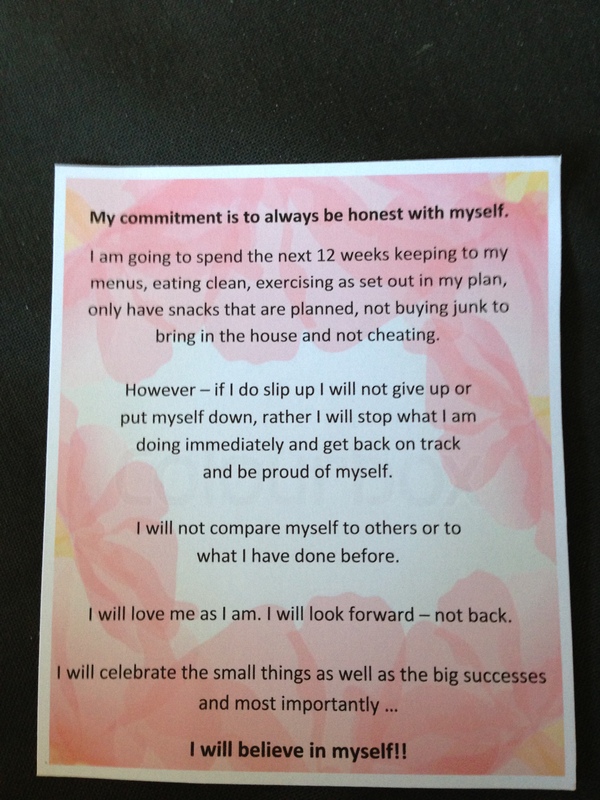 And then, perhaps most importantly, there is my commitment – to me. This is my round and I am ready ! !